Tanesha Sutton is a favorite of the University of Maine women’s basketball team, in great part because of her versatility. 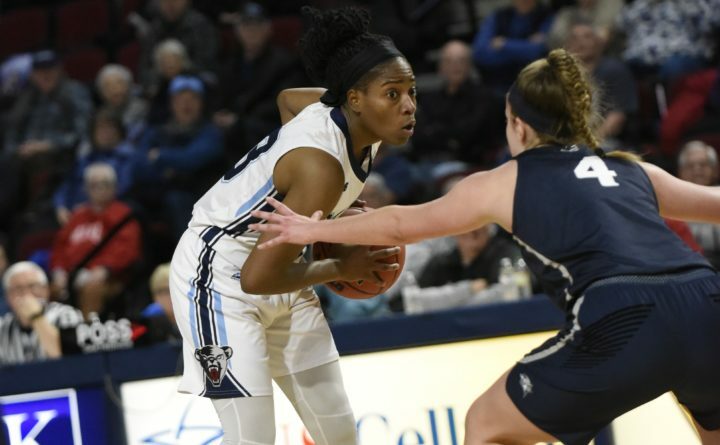 The 5-foot-10-inch redshirt senior forward from Philadelphia also has fans within the America East world, far beyond the Orono campus, for the type of play she displayed Wednesday night as the Black Bears opened their conference schedule with a 67-46 victory over New Hampshire at the Cross Insurance Center. Sutton played through illness to fill the stat sheet with 15 points, 10 rebounds, six assists and two steals as coach Amy Vachon’s club ended a four-game losing streak and improved its record to 8-6 heading into a 1 p.m. home game Saturday against Maryland, Baltimore County. “Tanesha has always been such a tough matchup over the years for us and tonight was no different on the boards and with how she passes the ball,” said ninth-year New Hampshire coach Maureen Magarity. “To me she’s just the engine that keeps them going, she’s so consistent. Senior guard Parise Rossignol, who missed Sunday’s loss to Chattanooga after suffering a back injury a day earlier against Fordham, returned to the lineup and scored a team-high 18 points on efficient 8-of-9 shooting from the field. “All week we’ve been talking about cutting hard and how that opens us up for good shots and that’s how I got a lot of my points, just making hard cuts and my teammates finding me for easy buckets,” said Rossignol. Junior guard Blanca Millan also fought off illness to add 13 points for the Black Bears, who received four points, three rebounds and two assists in 21 minutes from 6-1 junior center Fanny Wadling, who saw her first action after missing the previous 10 games due to a concussion. Senior center Ashley Storey, the 2015 Miss Maine Basketball from Greely High School in Cumberland Center, led UNH with a game-high 20 points and six rebounds. The 3-11 Wildcats — who entered the game averaging just 54.5 points per contest this season — otherwise struggled offensively while suffering their fourth straight defeat. UNH shot just 37.5 percent (15 of 40) from the field for the game compared to 49 percent (24 of 49) for UMaine. The Black Bears outrebounded the Wildcats 37-18, including 13-5 at the offensive end. UMaine scored the first eight points of the game en route to a 34-20 halftime lead, then opened the second half with nine unanswered points. Wadling got the Black Bears off to a hot start in the third quarter, first with a pass from the high post to Rossignol for a layup and then, after a 3-pointer by Sutton, with a low-post basket as UMaine stretched its lead to 41-20 and prompted a UNH timeout with 8:10 left in the third quarter. Rossignol then hit a jumper from the right baseline to stretch the Black Bears’ advantage to 43-20. UMaine took a 47-31 lead into the fourth quarter. Storey, who scored 10 of 12 UNH points during one stretch midway through the second half, made two free throws 23 seconds into the final period to narrow the gap to 47-33, but Rossignol answered with a 3-pointer from the right wing, a backdoor cut for a layup off a Sutton assist and a layup to push UMaine’s lead back to 54-35 midway through the fourth quarter. “They just have so many different weapons and are so balanced inside-out,” said Magarity. “Honestly, for the most part we did a good job defending their motion offense, probably one of the better jobs we’ve done over the years.